10 Cloverfield Lane Review - The Non-Sequel You Have To See? - Are You Screening? 10 Cloverfield Lane Review – The Non-Sequel You Have To See? 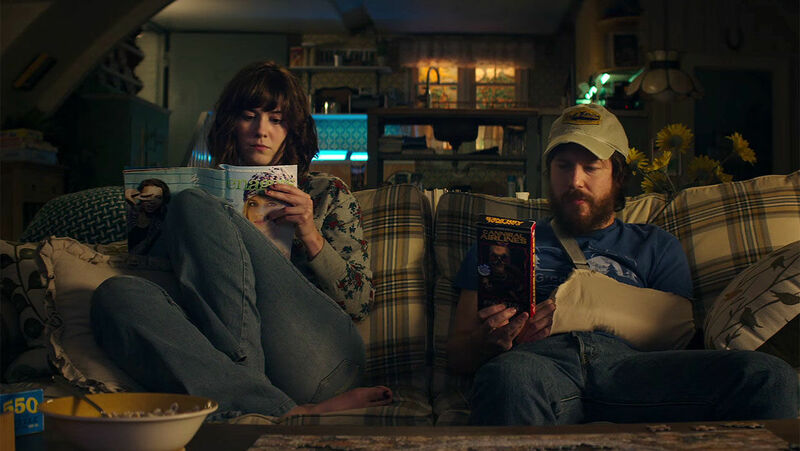 In a world overflowing with sequels, the trailers for 10 Cloverfield Lane might be rather confusing to those for whom the connection is supposed to be most meaningful. In the end, the only real notice you get from the inclusion of “Cloverfield” comes by way of watching something that has a few interesting moments, but is laughably ridiculous. That isn’t to say that it doesn’t somehow end up being a fun film. It’s just that it’s as disposable as it is entertaining. In an opening that is unnecessarily long and detailed, Michelle (Mary Elizabeth Winstead) goes through the paces of leaving her boyfriend, and is in an accident while cruising the highway in, more or less, the middle of nowhere. She wakes to find herself chained to a wall in a bunker. Howard (John Goodman), it turns out, “rescued” her from the certain death he claims is waiting outside his personal doomsday retreat. He isn’t sure what sort of attack happened, but some attack happened, and the air outside is poisoned one way or another. Adding a certain amount of credibility to Howard’s claims is Emmett (John Gallagher Jr.), a local man who knew of Howard’s bunker, and claims to have witnessed some part of the attack with his own eyes. Still, Howard doesn’t exactly act like a savior. In fact, he acts like the conspiracy theorist that conspiracy theorists try to distance themselves from. After all, he has one hell of a doomsday bunker. He also has a gun and a violent temper, and he isn’t letting anyone out. But, does being a loon necessarily mean you’re wrong about the end of the world… or whatever? The setup provides a unique look at an uncomfortable situation, which means the film has the means to work a tense thrill ride, as long as it sticks with the reality and gravity of the situation it creates. Adding a willing participant to the hostage scenario means it’s easy to keep you guessing, no matter what Howard does, and adds avenues of exploration when you’re trying to build/examine characters. When the movie holds to the unraveling of this situation, it is at worst oozing with the fun of a “hold your breath,” stressfest, and at best a white-knuckle adventure you can’t look away from. But, the film has other plans in mind, and it not only has an ending that it has to account for along the way, but has a couple of pseudo-ending reveals to keep you off balance. Where it all goes goofy, beyond simply that the ultimate “true” story is stupid, isn’t different than any other movie that can’t decide which movie it is. Blending genres, and even genre tropes, is something that has gained a lot of popularity recently, mainly because a few movies managed it so well. But, it’s a tricky effort, and one that requires a lot of thought when it comes to how to pull it off. 10 Cloverfield Lane is after being a straight tension film, one which might call itself a cousin of something like Prisoners, but it also wants to relate itself, not just to the light and wild entertainment of its namesake, but to the lamest tropes of schlock horror. This not only comes by way of the simple avoidance of a realistic approach to moving the narrative forward, but also by timing stunts (X happens, beyond all probability, at exactly time Y). The two just don’t work together, despite the many positives the film actually provides, including wonderful acting by everyone involved. It’s one thing to mix your effort up with elements that aren’t in the realm of the standard way stories, films, and/or genres are put together. It’s quite another to have theories in play that work against each other. That said, if there’s any chance that you’ll like it, you’ll probably have a pretty good time… as long as you know what to expect. It’s the movie equivalent of going with your friends to a restaurant that, while you didn’t send the food back, you aren’t going back to. You probably had a good time, but it had nothing to do with the food… but, at least you ate. The parts don't make for a worthwhile whole, despite the fact that a lot of them are great parts.